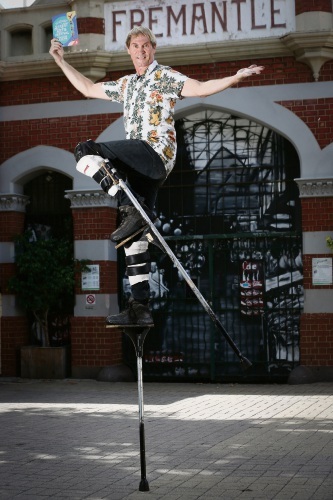 FROM sword swallowing to acrobats and roving performers, all these acts will feature in the 2019 Fremantle International Street Arts Festival. Curator Brendan Coleman said for this year’s event he has collected a range of acts which were Australian exclusives. “Last year was the 20th year, we had a lot of fun with that by inviting a centrepiece with the birds from the Netherlands,” he said. “This year the program is full of performers that have been on my bucket list for a number of years. “A highlight is Cho Kairin , who was the World Champion of Daidogei (performers) World Cup Shizuoka in 2017.
International Street Arts Festival Curator Brendan Coleman. Photo: Andrew Ritchie. Mr Coleman said the festival was programmed to be fun and accessible for everyone. “We take Fremantle as the set, we have ‘Bug N’ Buz’ who will perform in a caf,” he said. “I really try and find something that makes people feel something, laughter or excitement. “If you head to the road closures along South Terrace there are five stages with music, comedy and circus. Mr Coleman said he had been overwhelmed with the response to perform on Good Friday. “This year the Sail and Anchor will be open for the first time,” he said.